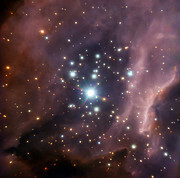 New images released today by ESO delve into the heart of a cosmic cloud, called RCW 38, crowded with budding stars and planetary systems. There, young stars bombard fledgling suns and planets with powerful winds and blazing light, helped in their task by short-lived, massive stars that explode as supernovae. In some cases, this onslaught cooks away the matter that may eventually form new solar systems. Scientists think that our own Solar System emerged from such an environment. 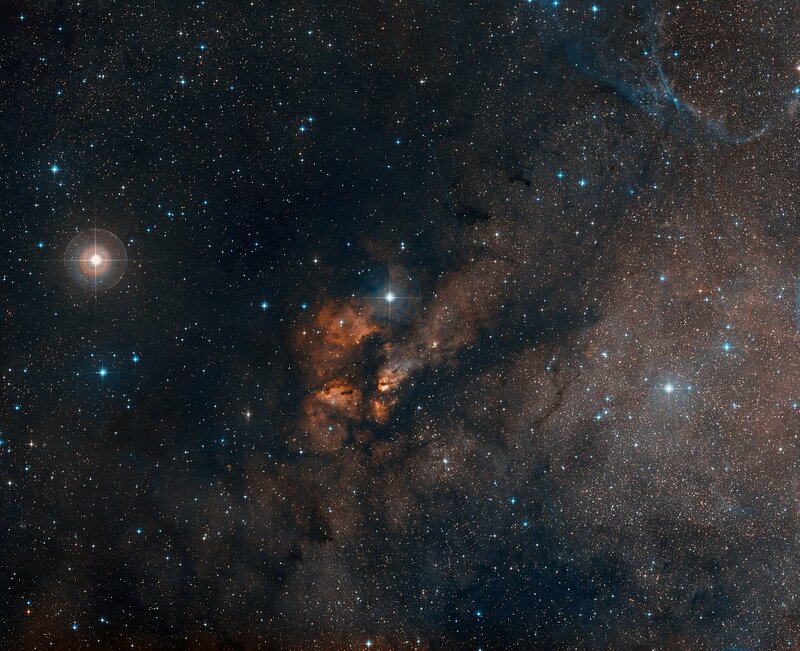 “By looking at star clusters like RCW 38, we can learn a great deal about the origins of our Solar System and others, as well as those stars and planets that have yet to come”, says Kim DeRose, first author of the new study that appears in the Astronomical Journal. 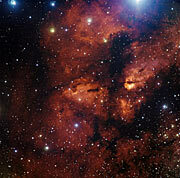 DeRose did her work on RCW 38 as an undergraduate student at the Harvard-Smithsonian Center for Astrophysics, USA. 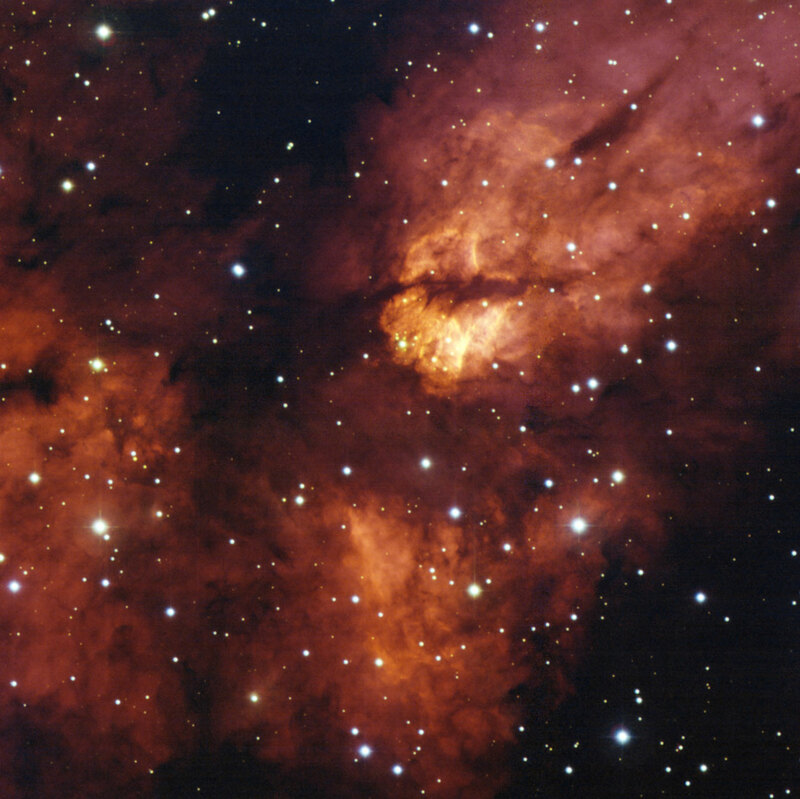 Using the NACO adaptive optics instrument on ESO’s Very Large Telescope , astronomers have obtained the sharpest image yet of RCW 38. They focused on a small area in the centre of the cluster that surrounds the massive star IRS2, which glows in the searing, white-blue range, the hottest surface colour and temperatures possible for stars. These dramatic observations revealed that IRS2 is actually not one, but two stars — a binary system consisting of twin scorching stars, separated by about 500 times the Earth–Sun distance. In the NACO image, the astronomers found a handful of protostars — the faintly luminous precursors to fully realised stars — and dozens of other candidate stars that have eked out an existence here despite the powerful ultraviolet light radiated by IRS2. Some of these gestating stars may, however, not get past the protostar stage. IRS2’s strong radiation energises and disperses the material that might otherwise collapse into new stars, or that has settled into so-called protoplanetary discs around developing stars. In the course of several million years, the surviving discs may give rise to the planets, moons and comets that make up planetary systems like our own. The name “NACO” is a combination of the Nasmyth Adaptive Optics System (NAOS) and the Near-Infrared Imager and Spectrograph (CONICA). Adaptive optics cancels out most of the image-distorting turbulence in Earth’s atmosphere caused by temperature variations and wind. 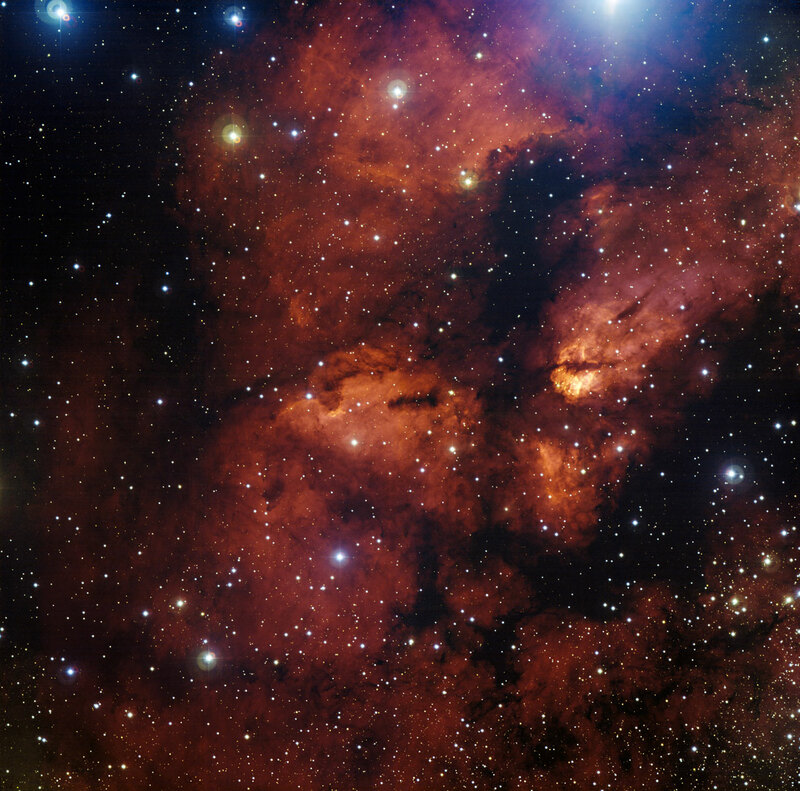 This research was presented in a paper that appeared in the Astronomical Journal: A Very Large Telescope / NACO study of star formation in the massive embedded cluster RCW 38, by DeRose et al. (2009, AJ, 138, 33-45). The team is composed of K.L. DeRose, T.L. Bourke, R.A. Gutermuth and S.J. 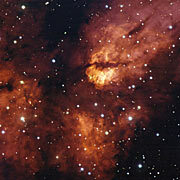 Wolk (Harvard-Smithsonian Center for Astrophysics, Cambridge, USA), S.T. Megeath (Department of Physics and Astronomy, The University of Toledo, USA), J. Alves (Centro Astronómico Hispano Alemán, Almeria, Spain), and D. Nürnberger (ESO).